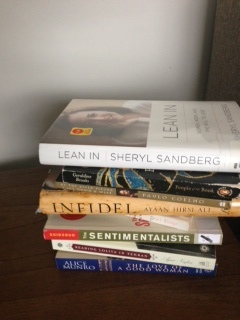 Home > Books	> Lean In, Loser. This is a great post, Deana–an astute review of a book I haven’t read for some of the very reasons you mention. Yes, it’s easier to take risks when your Oprah on speed-dial. And, yes, I imagine she has someone to manage the grill, set the table and serve the meal. Her life is charmed, and you have made that point with a charm that comes from having done all the hard work without someone or something to lean on.